My good friend and colleague, David Burnett, who wrote this really great piece about his experience "in the buffer" covering election night in Chicago - History In The Buffer - and which is a remarkable diary of his election night experience, and well worth a read, has put together a really interesting piece about his experiences behind the scenes at the Olympics. Check it out! The Olympics You Didn't See from David Burnett on Vimeo. One of my daily reads is Seth Godin's blog. He has a lot of good things to say, and I know that others, including Leslie Burns Dell'Acqua reads him daily as well, and she too highlighted his message for the day about mediocrity. I'll take a similar tact. When you are not paying attention to the details, you could well cost your business a lot of money, and certainly a diminished reputation. Today, Seth wrote - The sad lie of mediocrity - "The sad lie of mediocrity is the mistaken belief that partial effort yields partial results. In fact, the results are usually totally out of proportion to the incremental effort." 1) Recently, a colleague of mine wrote to someone, and addressed them as "Mrs." The problem is, she is a he. Because a large majority of our clients are DC based, the software we use auto-fills in Washington DC for that client, but someone wasn't paying attention when that estimate went out. Paying attention to details, smiling when you're talking to clients, being upbeat and positive during those interactions, saying things like "let me figure out a way to make that happen..." instead of "I don't know if that's possible", and so many other variations on that theme are what differentiates you from your competition. Don't say "the problem we might run into with doing it that way...". Instead, try "we'll have a bit of a challenge in trying to make things work that way...", which suggests you are up for the challenge, and are thinking of ways to solve the problem. Excellent customer service is key. Customer dis-service, distain, or mediocrity when cast in their direction is a disaster. You just might not realize it until it's too late. Thanks to a reader of the previous post on StockShop, who alerted me to the fact that Pixish has ceased to exist. We wrote rather critically - Pixish, Stupid is, as Stupid Does (2/12/08), about their business model, because, well, it was a bad idea. So, we tried to visit their site, and it's dead. Blank. Goes. And? Oh right - Good Riddance! Pixish will be closing its doors at the end of the month. Why? Mostly because of personal stuff. Pixish was created by four people as a side project. Between us, the last year has brought births, deaths, and too many job/client changes to remember. As a result, we have not been able to give the site the time and attention it deserved. On the other side of the equation, the site's community never really gelled. In nine months we only grew to about 5,000 members. With time short and usage low, we've decided it's time to pull the plug. What went wrong? In a sense, nothing. We had an idea and wanted to try it out. We did it on our own time, without spending much money. I'm proud that we were able to learn a few things without going broke. People have spent far more creating much less. And I'm happy that some people had fun as part of the site. In another sense, of course, we made some mistakes. Here are my top three. We launched too fast. 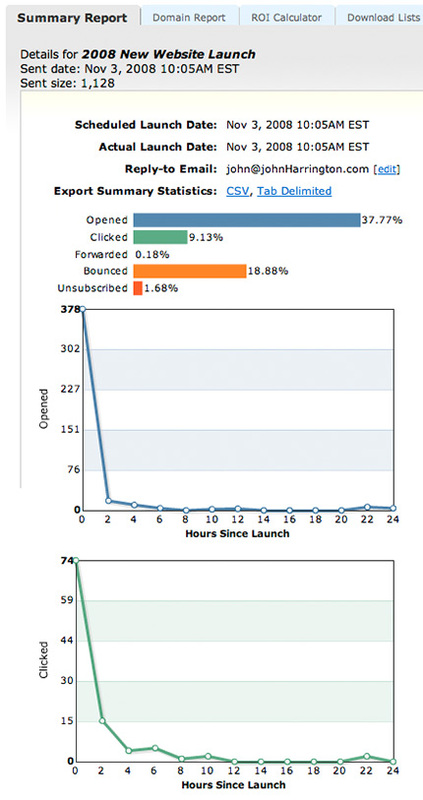 I'm a big believer in launch fast, get feedback, make changes. We launched fast, got more feedback than we could handle, and failed to make changes. You can't expect people to wait for you to get it right. We didn't describe what we wanted to do clearly enough. When I told people the idea in person, they always really liked it. But when they came to the site, they didn't get it. We underestimated the "spec work" issue. People feel strongly about it, and as a professional designer for over a decade, I get it. In hindsight, we could have dealt with it better. The startup experience can't be taught, only learned from experience. Here are a few things I learned from Pixish. In community-generated media, trust is everything. When you ask for submissions, contributors go through an instant internal calculation: "Do I trust these people with my work?" When your site is brand new, you've got no record to rely on. And with more shady "user-generated content" schemes popping up every day, people have their defenses up (as well they should). Our proposition was made even more complicated because we were trying to create a maketplace. When a magazine opens for submissions, you're submitting to that magazine. But Pixish was one step removed - anyone could make an assignment. So even if you trusted Pixish, you didn't necessarily trust the person who posted the assignment. We should have done more to earn that trust, and help members trust each other. There's a difference between building a community and a network. When musician Jonathan Coulton posted a t-shirt contest, people in his community were stoked to participate, but people outside of his community were like, who's this guy and why should I give him my work? Pixish was designed as one community, but it really was a network of unaffiliated communities. The assignments that worked best happened because the publisher brought in their own people. The site was not optimized for that. We should have had more tools for assignment creators to tie their contests to their existing communities. Launch fast, but not too fast. That old cliché about not getting a second chance to make a first impression? Corny but true. When you stumble out of the gate, it can be hard to regain your footing. We should have done more testing of both the core idea and the site itself. Money matters. I've now started companies with both with, and without, venture capital. When you've got money, you can take more time to do it right, but you've got higher expectations for returns, and a whole host of other complications. When you go it alone, you've got the freedom to do whatever you want, but it's hard to stay focused when the project is always competing for your attention with other, usually paying, work. There's no right answer here - it's just a matter of finding the approach that best matches the project. It's all about the team. I will continue to sing the praises of the amazing team that built Pixish: Jason, Dan, and James. The decision to end the project has nothing to do with their awesomeness. The only thing I really regret is that we were never able to build some of the really cool stuff we had planned. I know there's a place for a wisdom of crowds approach in the publishing world, but publishers and artists are still figuring it out. For now, it seems like a direct submission model is what people are most comfortable with. If you're a Pixish member, thanks for giving the site a try, and I'm sorry our time together was so short. You've got until the end of the month to download anything you need, though I assume you've still got it all on your hard drive anyway. If you're looking for something similar, try Crowdspring or 99designs. Whew! One down, how many to go? Damn, these things are popping up like weeds in an untended yard! On Demand is StockShop's newest feature. Can't find exactly what you're looking for? Let one of our talented photographers capture it for you! Wasn't it already tried by several companies who, no doubt, have smart people working for them? This idea is (and remains) just plain bad. However, I guess this is what happens when people have time on their hands, and decide they will fill it with "custom stock" projects. Projects that, quite frankly, are ASSIGNMENTS that should be commissioned by the clients, with all expenses paid, and so forth. We wrote back in July of 2007 - OnRequest - Realizing the Obvious, "David Norris, the head of OnRequest, after building a business around the CustomStock Model...said of the CustomStock model:"
"that model was interesting, but didn't pan out." And again, the refrain rises: WELL, OF COURSE IT DIDN'T! Yet, again, we have a company that thinks they can do it better. Think again. Photo editors often get a bad rap. They're often (incorrectly) blamed for the bad contracts they are required to foist upon us. Sometimes, it's their idea, but usually, it's not. It's usually the legal department making things harder for them to get talented work to sign things like work-for-hire, and so forth. Thus, when a photo editor does the right thing, as is the case here, we feel it of value to hearld it from the treetops, so to speak. This is the case of a photo editor who licensed images through Digital Railroad for several books, with over fifty images. They'd downloaded them, and had recieved an invoice from DRR. Yet, when they were about to pay it (the books have not gone to press yet), they learned that DRR was in trouble, and likely closing their doors, so they waited before cutting the check. Imagine my pleasant surprise when they called me and shared this story, and said "we want to pay you directly, since we know that if we pay them, you'll never see the money." I was eager, of course, to help. They are also looking to finalize their contacting of other photographers whose images they had selected. We've offered to help them find anyone who they can't locate, and await any information from them on that front. So, three cheers for Brad Epstein, of Michaelson Entertainment for his effort in doing the right thing. Thanks Brad. Newscom, reportedly the company that submitted their letter of intent to acquire the assets of Digital Railroad (From Bad to Better - Likely Acquisition of DRR Assets By Newscom A Good Thing, 11/1/08), has taken themselves out of play as a party interested in the final disposition of those assets. "We looked at it long and hard", said Bill Creighton, Managing Director of Newscom. "We were the company that had expressed an interest, but after we looked at the numbers - the cost to operate the system, and the fact that many of the subscribers had left, it just wasn't workable", said Creighton. Newscom was the one company who had expressed an interest in paying cash for the assets. Another rumored company was proposing an equity stake, but that has, to date, remained a rumor. "We're no longer interested in Digital Railroad. We wanted to be, but it just didn't make sense from a business standpoint, and that's what this is about - business." So, how do you go about marketing yourself when you want a ready-made solution that you can implement in a brief period of time, with maximum impact? You outsource. You are a specialist in your field - photography. So too, was your wet-lab technician in processing your film. So too, are you struggling with mastering photoshop/lightroom/etc in your post-production and workflow efforts. All of these things presumes you have work. However, what if you don't have any? Want more? Want to promote your new website? We outlined how to use a bare-bones solution like Vertical Response (Marketing 101: Bare-Bones-ing It With Vertical Response, 10/5/08), and that works - when you actually have a list of people to market to. What if you don't? Then, how much will it cost you each month in time, or dollars out-laid to an assistant to update your lists? I submit that your monthly costs will exceed $60 or so, and if that's the case, then why not entrust it to an outsourcing solution like many other things we outsource? Why not let a professional handle the distribution of your marketing materials? Heck, you entrusted the postman when you were using snail mail! To that end, I thought I'd walk you through my experience using the service AdBase. Step-by-step, so you can see how easy it is. Yes, AgencyAccess, and others, are out there, and yes, AdBase has a free trial here, so too, AgencyAccess here. But, often we as photographers fear the unknown, so this will de-mystify it for you. Show you what's possible. But, it's by no means exhaustive. This is one way, but there are, of course, many others. So here we go - step-by-step, though setting up a mailing list campaign using AdBase, and then summary thoughts and pricing information at the end. The first thing you'll do on the home page, once you're signed in, is go create a list of people you want to make out reach to. You can, of course, use pre-made lists, but let's go through the process of creating our own. First click on the My ADBASE tab, as shown below. Scroll down to the "List" section, and choose from the drop-down menu "Custom List". Once you've done that, ADBASE has broken down the variety of categories into several super categories, separated by US, and Canadian. Below, for this mailing, we've chosen US Print Advertising, and there are a total of 10,266 e-mail addresses at 1,953 companies that hire, within that category, across the country. We can further narrow down that field using one of the other 8 filters, from agency size, job title, type of business, and so forth. With that in mind, let's make outreach to just the geographic region that is "Northeast", as chosen below. We could have specified one or more area codes, or even a specific zip code. Remember, we're building a list here, and more importantly, we can build multiple custom lists. 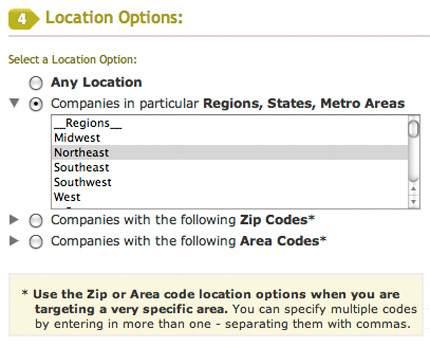 So, if I wanted to build a list for the DC area, I would choose area codes 202, 703, and 301. If I then wanted to add in Baltimore and Richmond, I would build a list that included those area codes. 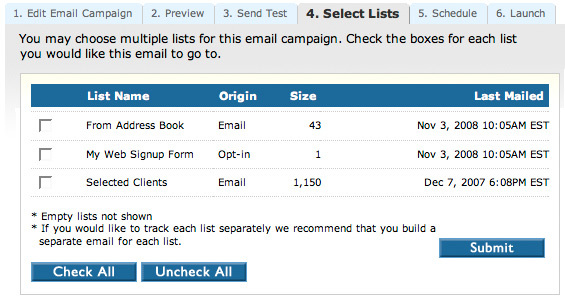 And lastly, we can then select multiple lists to mail to as a part of the mailing. So, you can take the shotgun "pray and spray" approach, or you can take a snipers tact, with extreme precision - say, just award-winning firms in the 202 area code that have billings over $5m a year? Bingo, you can do that. Below is the summary of our list, refined by region to just 3,901 e-mail addresses. While that may seem like a small number, it's still a huge number, and probably not one you can manage to market to, and to maintain an ongoing market outreach to. Remember, this is a marathon, not a sprint, so choose your recipients with the notion that you will be marketing to them over time, repetitively. 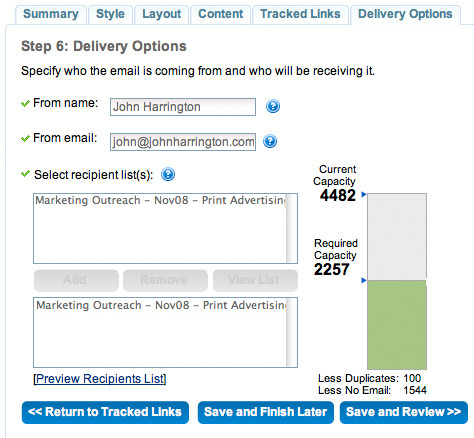 Below you will see the tab for your next destination - eMailer. Click that tab, and let's have a look. Below is the "Summary" tab, and you'll want to start here. Choose a name that means something to you, and then begin to choose what type of e-mail you want to send. 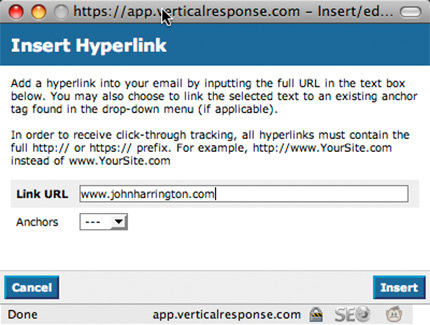 For my first attempt with them, I took the same html template that I used on Vertical Response, and sent that out. Here, we're going to use a very basic version of one of their templates, and talk about some of the variations you can apply to those. Your next tab is the "Style" tab. Of course, as you become more familiar with the features and options, you can choose to customize them, but in this case, I'll be choosing the Simple Black style. Up next is the layout. 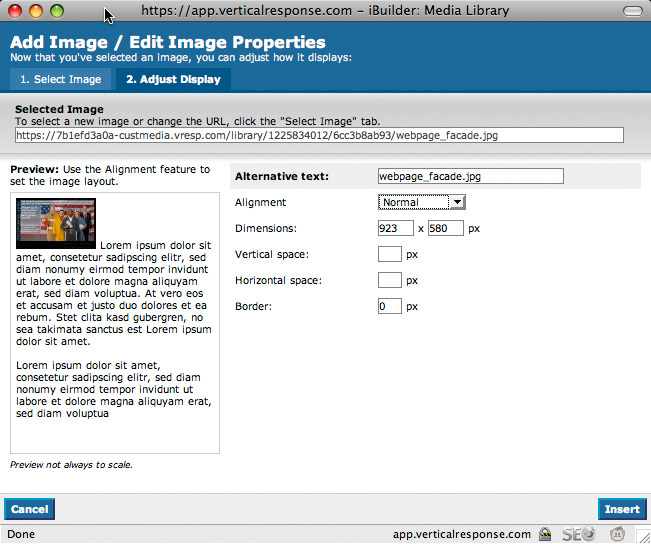 YOu can see that you can choose how any images, and the spacing between each. This is a very what-you-see-is-what-you-get (WYSIWYG) approach. If you want to add text in, other image areas, and so forth, just selecting the boxes allows you to do that very easily. 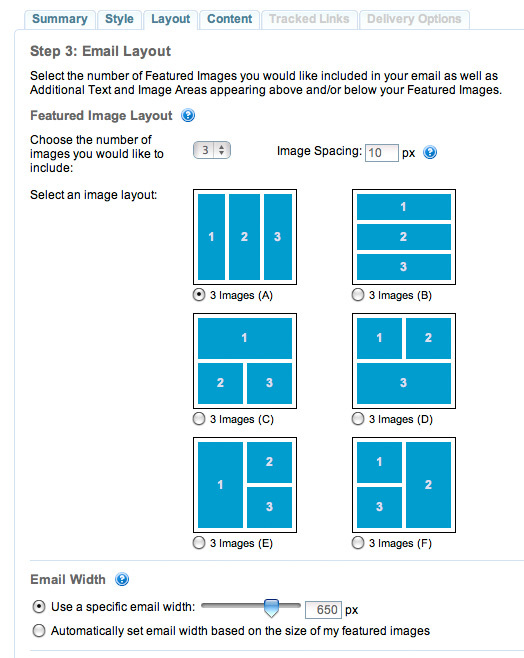 You can also specify the final width of the e-mail, and the default is 650 pixels. 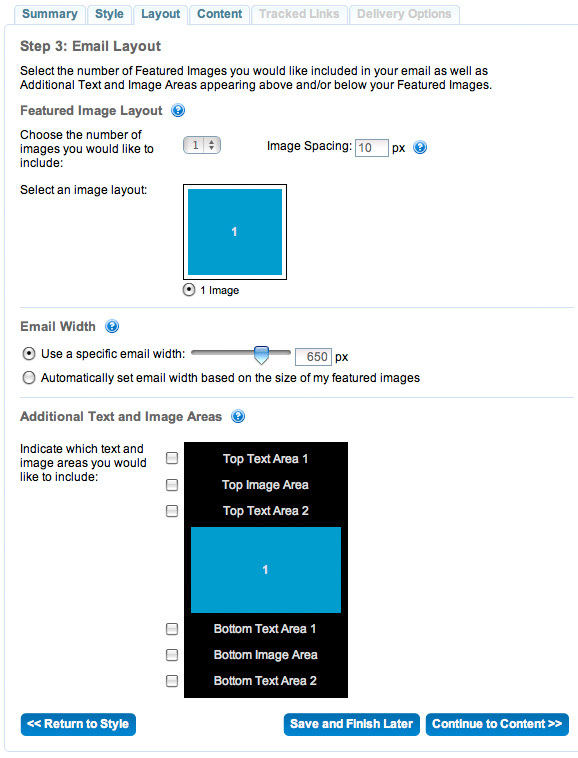 If you choose, as I have selected below, to have 3 images in the layout, you are presented with six variations to choose from, which pretty much runs the gamut of options. After looking at this, I decided that I wanted to do just one image, as above. Next up is the Content tab. Think long and hard about the subject line, to minimize the likelihood that it'll get deleted. What subject line would peak your interest? What would get an instant delete? Also of importance is the Plain Text box. This is the e-mail that people who don't get/want html e-mail will see, so be sure there's a link to click in there, as well as other insightful/informative text. As you can see, I've opted to personalize the salutation, which I did by clicking the small icon at the top of that box of the two heads, and chose the field - in this case - first name, whom I wanted to be identified in my salutation. I felt this was more personal than a "Hi there!" salutation. Next up is the Featured Image entry. 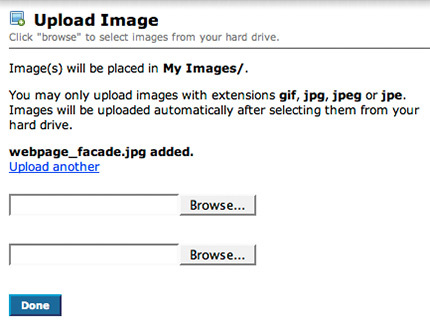 This is where you'll select or upload your image. 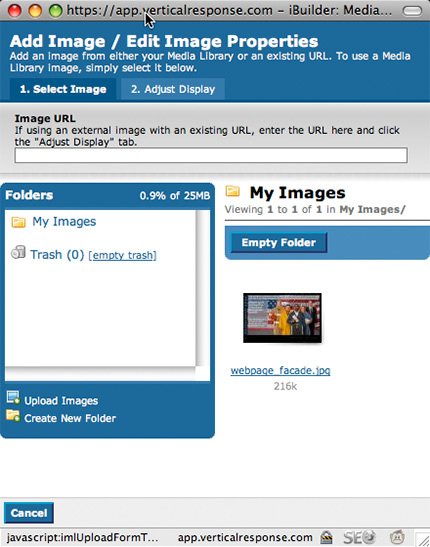 Since I don't have one already uploaded, once I click "Select", I'll choose the "Upload New Image" tab and upload it. Of critical importance is the "Terms" checkbox. If you're a photographer, it's easy to certify that you own the copyright - unless that work was shot as a Work-Made-For-Hire assignment, then you have no right to use the photo. If you are in another field - retoucher, or another field, you are certifying that you have permission from the photographer to use their image. 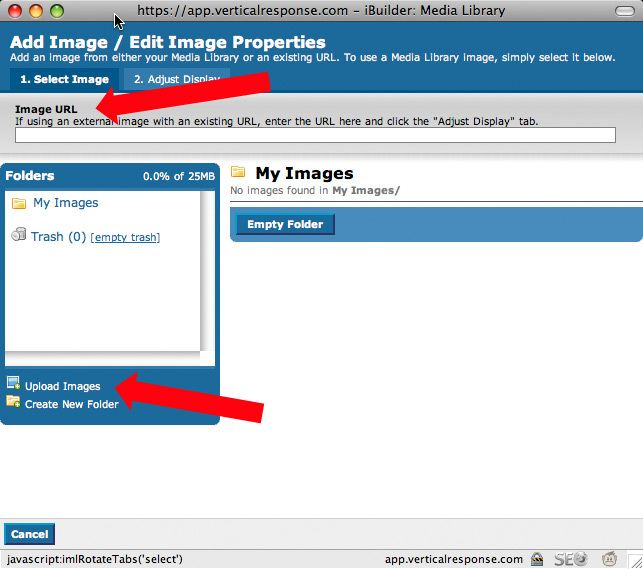 Once I've selected my image, named the file, the "Upload Image" button appears, and clicking that uploads the file to the ADBASE server. Now, we see a preview of everything, and on the left is a preview of the text inputs, and two images below is the preview of the what the e-mail will look like. You can click the "View Full-Size" button to see the e-mail, as well as all the other text at the bottom that is compliance information with SPAM laws. If I had opted to have text areas, I would see that information in this preview as well. Below is a general preview of the e-mail. If you're not careful, you'll miss the "Linked to" option. It's important that when someone mouse-over and then click on the images, they they get taken to your website, so clicking the "Add Link", and then entering in the destination information there is important, as shown below. 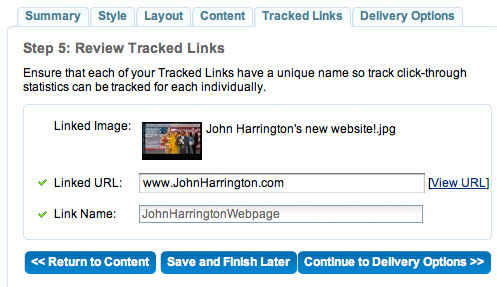 The next tab is the Tracked Links tab. These are the links that ADBASE will actually track for you to see if somone has clicked on the ad. 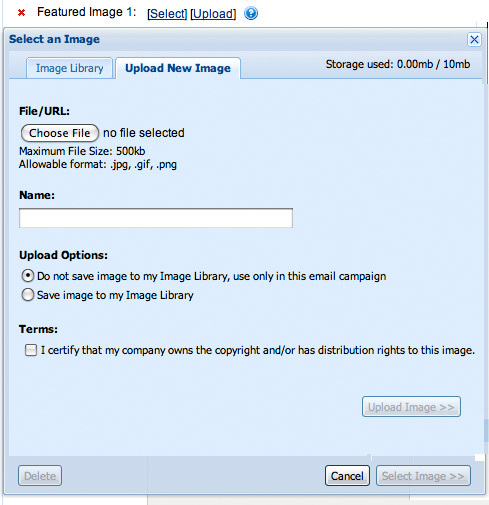 This is especially valuable when you have multiple images, to see which images were the most popular in the e-mail you sent out. Next tab is the Delivery Options tab. Here you'll fill out where the e-mail came from, and which list you've chosen. ADBASE will tell you how many e-mail credits you have left, and how many you'll be using up based upon the size of your list. Clicking the "Save and Review" tab above, you come to see everything specific to this e-mail campaign. When you're ready, click the "Schedule This Email to be Sent". Here, you may choose to do it immediately, or at a specific date and time. I strongly encourage you to be thoughtful about this and do it at the right time, not just rightaway. Then, you'll see that your e-mail is set and pending, ready to go, as below. Once the campaign is underway, you can see it in progress. Below is the first one I did, in progress. You can see that almost 1,000 people viewed my e-mail with the image, (the number well exceeded 1,000 when the entire campaign was done). What you can also see is that I didn't get a great deal of clicks through to my website. Perhaps this was as a result of a bad image choice, or the shotgun approach to the mailing in terms of reaching the right audience. I noticed that the open rate of your campaign is currently 17%. This is obviously lower than our system average. 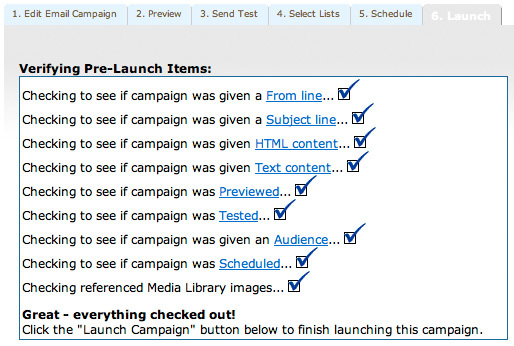 After taking a quick look at the lists that you sent your campaign to, it is clear that you didn’t spend a lot of time targeting your list (e.g. you mailed all magazines instead of picking magazines with specific subjects). In our experience, the more targeted the distribution, the higher the open rate. 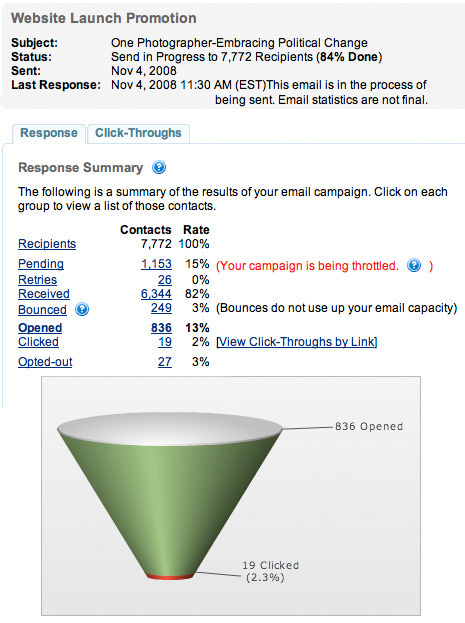 For comparison, the average email campaign sent using Emailer has a distribution of just over 1,000 contacts. I would also point out that the open rate you achieved with your Vertical Response campaign is much more in line with that one would get by mailing a personal client list which I believe is what you did. Ok, lesson learned, I won't do that again! Take special note of this - 84% done. ADBASE doesn't blast out every e-mail all at once. They do it over time. They do this so as to not otherwelm the recipient's servers. We do acknowledge that sending promos outside of business hours does reduce their open rate. Our average open rate is currently 21% overall. This goes up to 22% between the hours of 8am-6pm and drops to 18% after-hours. So the effect is not huge but it is still significant in our opinion. As a result, we are currently testing some changes to our back-end system that will prevent our mail throttling system from sending email outside of normal work hours. 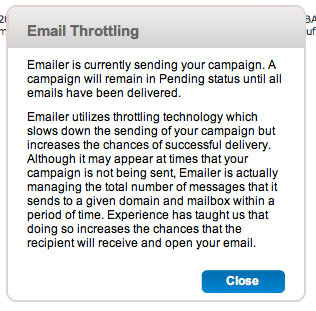 This will lead to campaigns taking a bit longer to send, but should have a positive impact on the overall open rate. So what does using the service cost? ADBASE subscriptions range in price from $395 to $1,695, with pricing depending upon the desired functionality and coverage each client requires. Their most popular editions are the Editorial edition and the Standard North America edition. If you wanted to go whole-hog, the Premium North America edition has the same functionality as the Standard North America edition, but includes 1) Emailer, their custom-designed email tool that allows you to determine which individuals open their email and visit their websites, for ease of followup, and 2) Fine Art data which includes art galleries, museums, and corporate art curators. The typical photographer/client chooses a North American subscription with Emailer, along with an annual capacity of 24,000 Emails. Overall, when this is sold as a bundle, the cost of each email works out to about 3.5 cents. Obviously this is more expensive than others, but they have built a system that is so specific to the needs of artists that they believe it still delivers a lot of value as evidenced by over 50% of our clients having added Emailer onto their subscriptions. 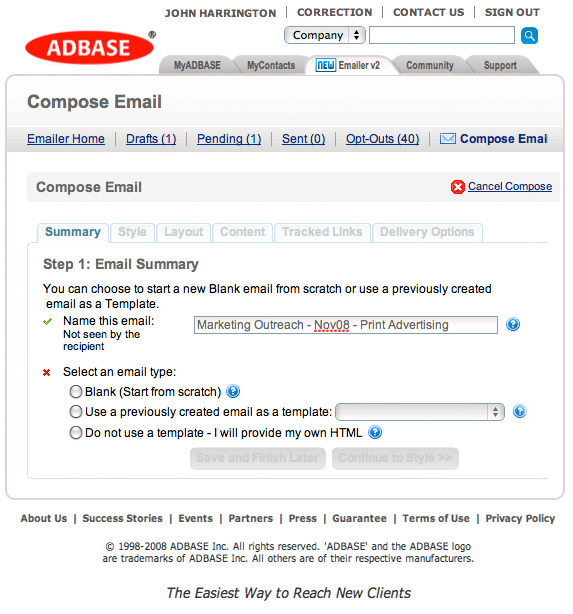 ADBASE is the only provider that offers an online email solution where you yourself create and send your promotions, freeform, or with the templates, as shown above. They also are able to pinpoint more than 25 specific regions, if you're taking a regional approach to your campaign. 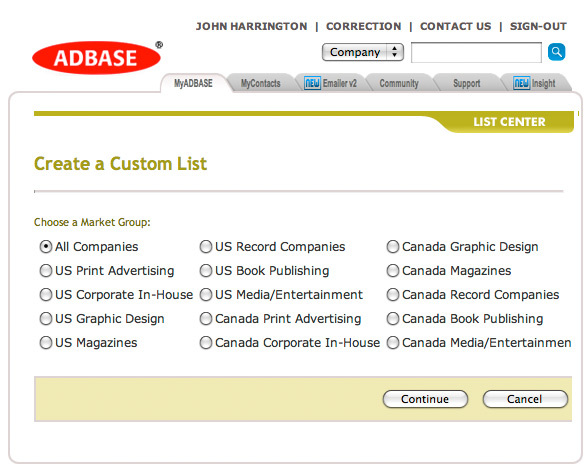 Lastly, ADBASE is the list provider used by ASMP, APA, Alt Pick, theispot, Serbin Communications and many others. Clearly, ADBASE is well defined as substantially different from options like Vertical Response, eROI, Constant Contact, and other bare-bones solutions, and making an investment in ADBASE is worthwhile to consider at approximately $0.035 per e-mail, up from $0.01 with Vertical Response. You no doubt saw that we just launched our new website two days ago, and we wanted to get the word out. How to do that? 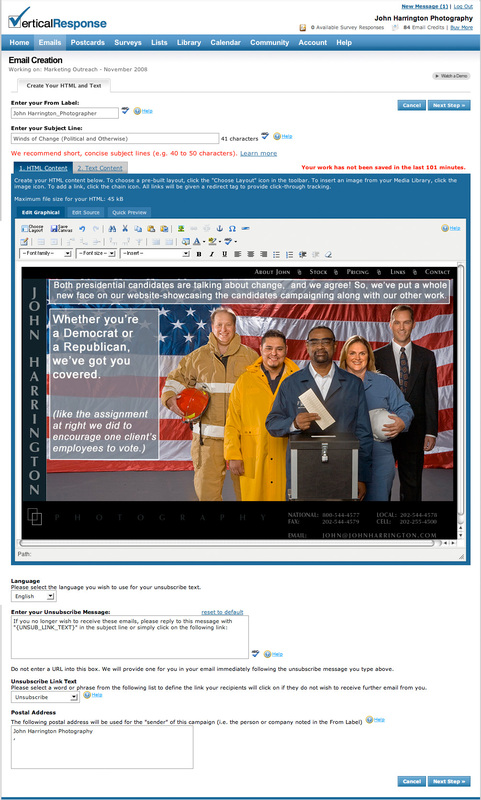 Send a silly e-mail with a few sentences? How could I know if that was effective? I turned to one solution - Vertical Response, that I was familiar with, and yes, they have a free trial. I know there are others - eROI, Contant Contact, and so forth. What follows is a step-by-step through the process we undertook to launch the campaign, and just how easy it was - save for gathering the list of people to actually send it to, more on solutions for that later. So, here we go - promoting the website launch. Below is the top of the webpage (note, every graphic below, when clicked, opens larger in a new window), showing that you're logged in, and giving you the control tabs to work on your campaign. Click on the "Emails" tab, and on the right, you'll see "New E-Mail". Click that link, and the options below appear. 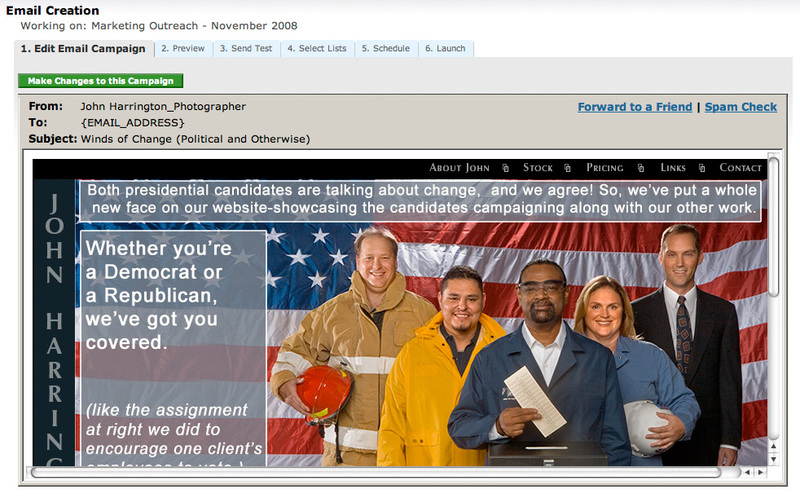 The default is "e-mail wizard", but that option gives you a lot of really funky templates, that I don't think are consistent with a professional-level photographers' website. When I sent out my campaign, I recreated my website as HTML, using the "Freeform HTML" option. 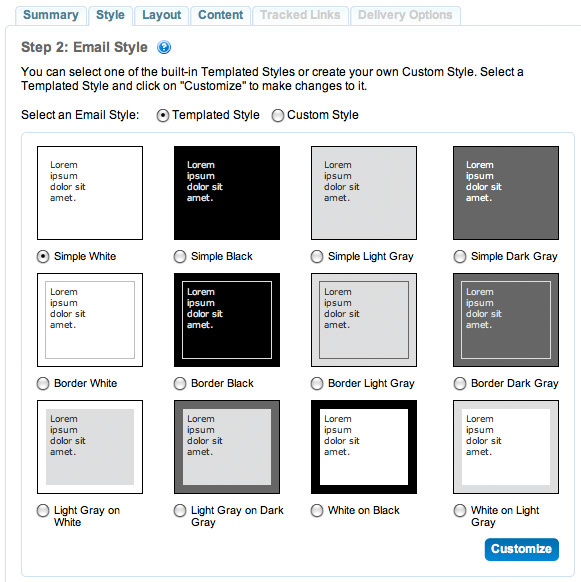 For this example, we're going to use the "Email Canvas" choice, so that you can insert a single image that is a screengrab of your website, or a single image of yours you want to showcase. 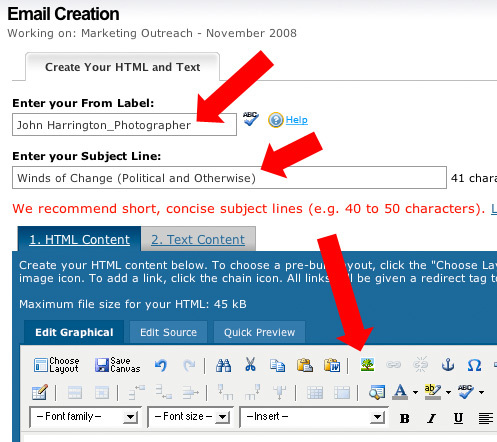 Below you will see the "Email Creation" section. 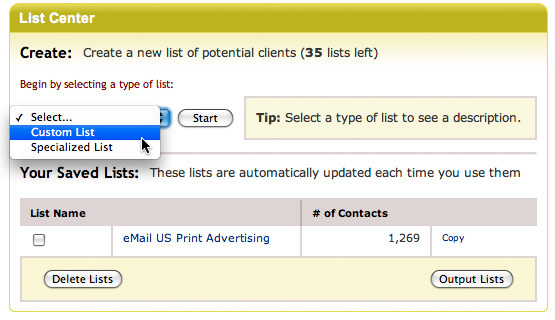 Choose the label that your e-mail will come from, and select a useful subject line. Then, click on the icon with a little tree on it, which is identifed by the bottom red arrow. 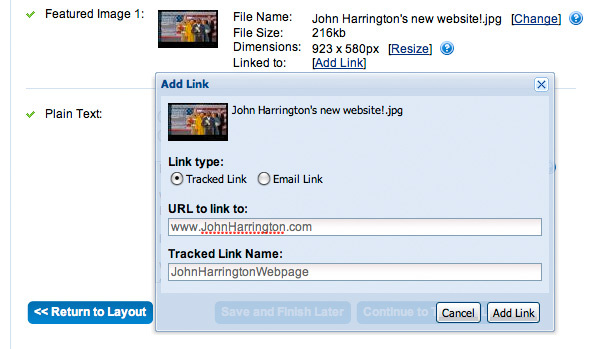 If you have an image that is currently on your website somewhere, you can paste the URL into the top entry line. 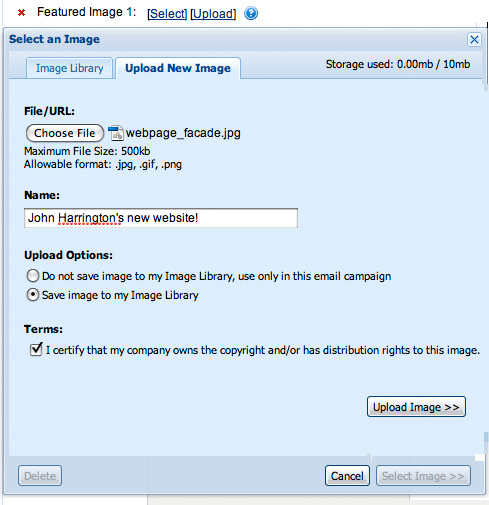 If you've done a screen grab of your site, or have the image on your computers desktop, just choose the "upload image" icon, as noted by the other red arrow. Below, there were three "Browse" buttons, and you will see that I have filled one up with the JPEG website_facade.jpg. That file will now reside on the Vertical Response server. Below, you'll now see what my image looks like, within their "My Images" folder. Double-click on that image and you will see the window below. 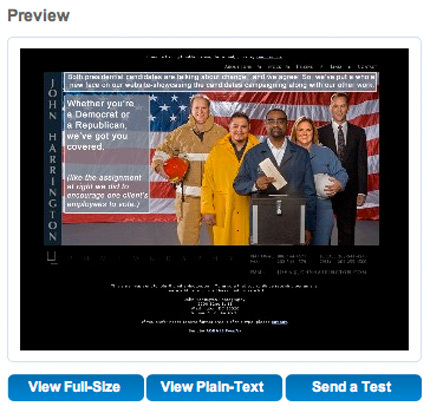 There, you can change your ALT text from the default filename (as shown) to something like "John Harrington's New Website", or something else. You can tweak other details of the image, like spacing, and so forth, but it's not necessary. You can also take note of the URL for that image in the top line. Up above you'll see the "Insert" button at the lower right. 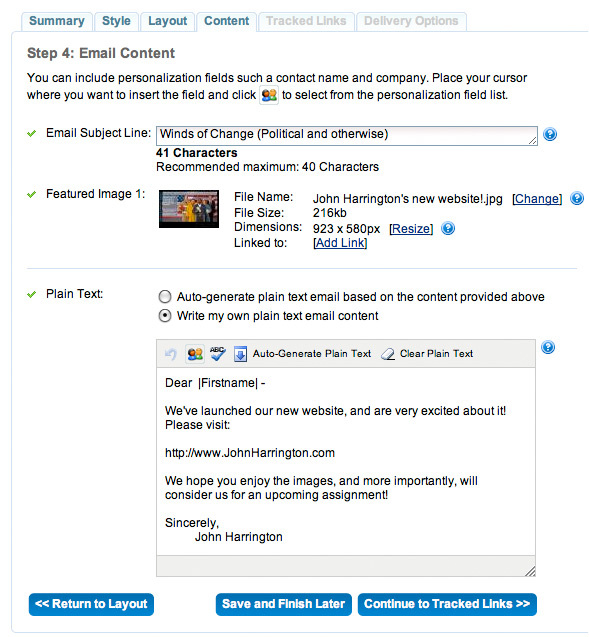 Click that, and you'll see the image inserted into your email page. At the bottom of the graphic below, you'll see that you need to put in your physical address, as well as other information to be compliant with SPAM laws. Be sure you do this completely. 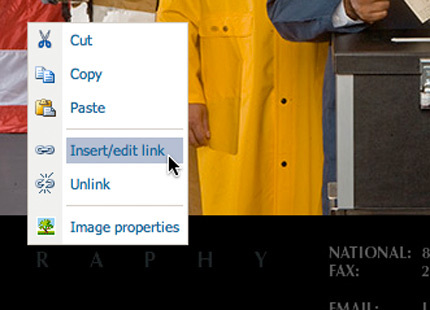 Next, as shown below, right-mouse (or cntrl) click the image, and choose the "Insert/Edit link", so that if someone clicks on the photo, they will be taken to your website. Below you'll see where you can type in your URL. Again, this is the URL that someone will be taken to if they click on the graphic. If you encounter any errors, just click on the "view source" tab to check the HTML, or confirm it works when you send yourself a test e-mail. Next up is the "Text Content" tab. 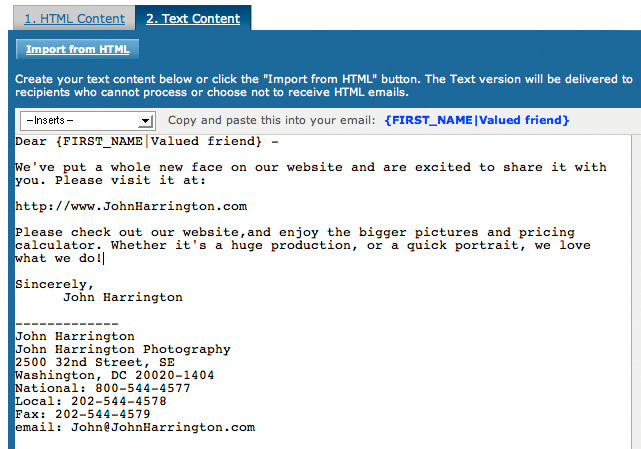 This is the e-mail that people will see if they don't get html e-mails, and there are very few of them - under 1%. However, you'll want to complete this text with something similar to what I've entered. Be sure there is a link to your website there! Following that, click on the "2. 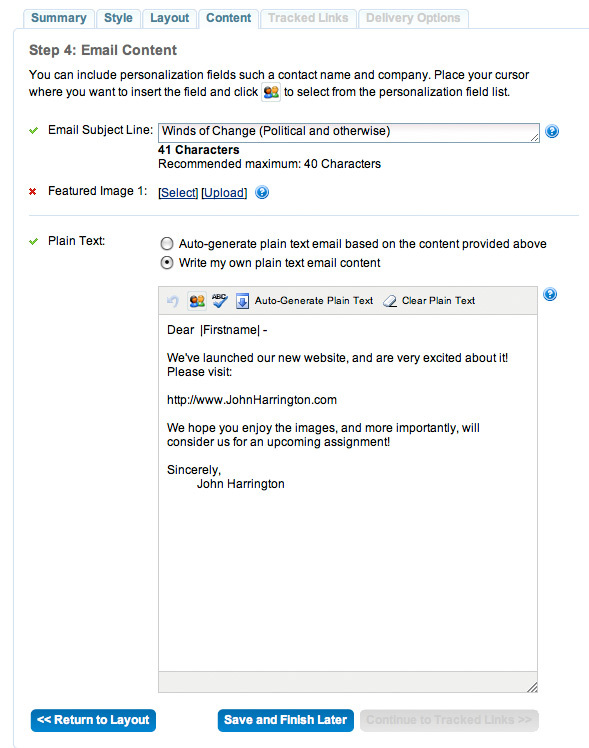 Preview" tab, and confirm that your e-mail looks good. Next is the "3. Send Test" tab. You can choose option 1, and elect to just have it sent to yourself, or you can include up to ten people to get the test. this is often helpful if you're working with a marketing consultant, or want feedback from a spouse/partner, trusted colleague, or whomever. They will get both the text version, and the graphic version. What you see will be exactly what your list gets. 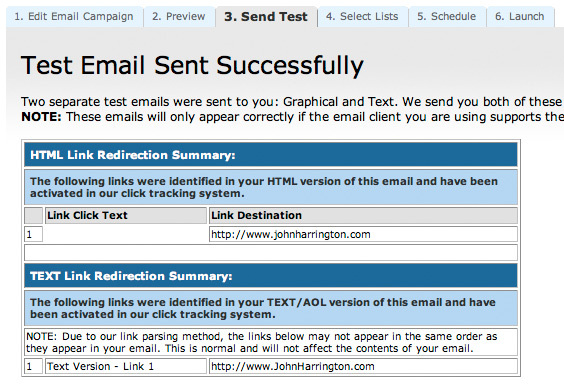 Once you've clicked the "Send Test" button, you will get confirmation that your test was sent, and the links that were converted from standard links, to trackable links, as detailed below. Next, it's time to select who you want e-mails to go to. Here's where your hard work begins, and where a list service like AdBase or AgencyAccess actually becomes significantly valuable, but more on them in another post. The challenge here is to collect a list of e-mails that you are targetting. Vertical Response charges about $13.00 per 1,000 e-mails they send out for you, and you buy them in blocks, but you have to populate the lists yourself. 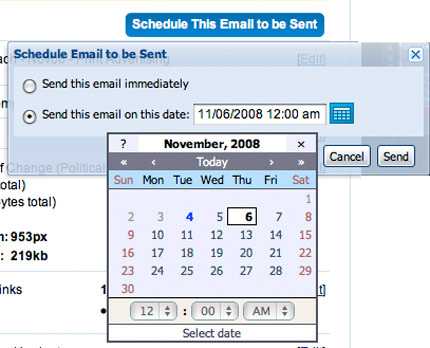 Next, you'll want to schedule your e-mail to go out, and you have a wide window to do so. 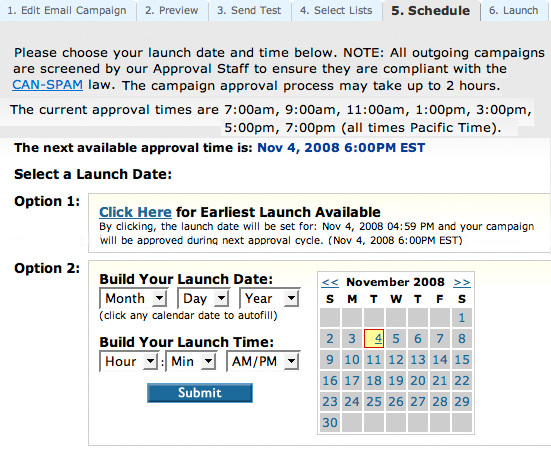 Vertical Response has a review schedule, because they want to make sure your e-mail complies with all laws, so you can choose to send it out at the earliest launch time available (Option 1) after their review, or set the time. I highly recommend you set the time yourself. No doubt many of you are working o n things like this at 8pm, or 2am, and if you contemplate your own nature, any e-mails you get at that time are not likely useful ones. Let people clear out their inboxes in the morning, and schedule it for a time after that, and remember time-zone variations too! Next is the last tab "Launch". Here, they validate that you have everything completed, and once you click "Launch Campaign" and it's in the queue for approval, you can't change the content or mailing list, but you can unlaunch and then re-submit it. So, that's it, bare-bones style. Vertical Response does not charge an annual fee, and the cost per e-mail is about $0.01. Yet, you have to do everything yourself, and the templates they offer are not photo-centric. You may ask - why bother, especially if I am just mailing to 20 or 50 people? Can't I just send the e-mail from my own desktop? It's detailed information like that below that is really helpful. It helps you see how effective the e-mail was. There's no "shot in the dark" approach. I see that over 37% of the people saw my image in the piece, and that a subset of that clicked through to my site. For a mailing of just over 1,100 people, that's a decent read/response rate. Would I have liked it to be higher? Sure. I also can see how fast people read/clicked it too. In addition, to can click that "Domain Report" tab, and see just how many people from each company opened it, clicked it, and even unsubscribed from your mailing list. 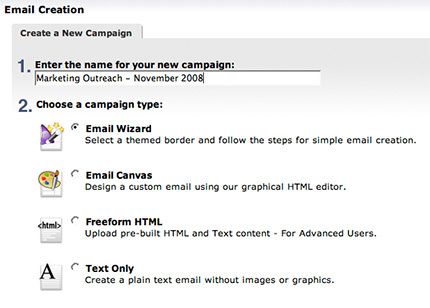 This is valuable information for you to have, and allows you to tailor your campaigns moving forward. Ok, so then, what's with all the companies selling lists? Do you really need to use them? Are they worth it? In a word - YES! Consider this - Adbase (information here) has multiple versions for artists, from Editorial, to Regional, to Standard, to Premium. And, if you click here, you can request a free trial to give them a spin. We are working on a review of their services, as comprehensive as this one. AgencyAccess has a free trial too, to check that offer out, click here. Mastheads.org is good if you are only interested in getting a few names off of a select number of mastheads. If you need to create or update a mailing list for direct marketing purposes, you would still have a considerable amount of work to do. 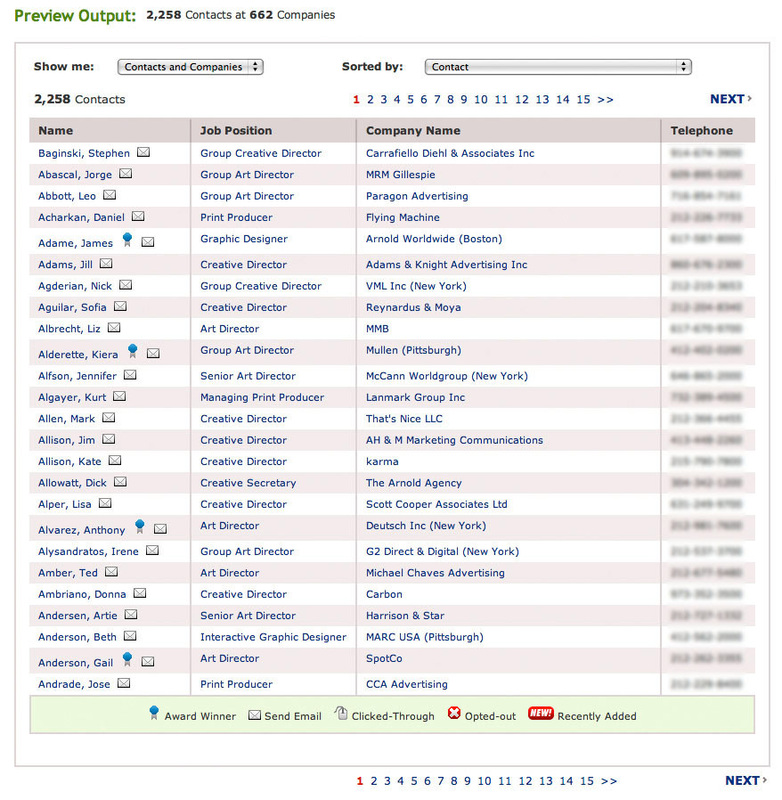 That is, you would still have to analyze the masthead to determine which contacts are of interest to you (i.e. involved in selecting a photographer), enter all the information into a database and double check every piece of information to make sure you didn't make any entry mistakes. The first time you do this, you would also have to check that the address provided in the masthead is the correct address for the contacts of interest to you as generally the contact information provided is for the advertising sales department. This might make sense if you are a photographer that works in a very specific niche and only targets a handful of magazines. Even then, the value of Mastheads.org is not clear as you would likely want to subscribe to those magazines to keep on top of what photography is being used. 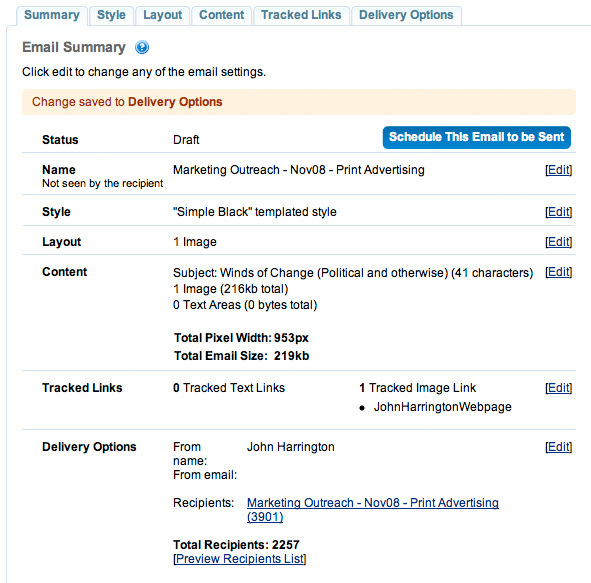 For any photographer doing more general work, the amount of effort required to keep a mailing list up-to-date using mastheads, whether from Mastheads.org or directly out of magazines, will quickly add up to much more than the cost of a subscription with a service like ADBASE. For example, say you can scan through a masthead every 5 minutes (which is aggressive if you include double checking and breaks -- it's pretty tedious work), that's 12 per hour on average. If you have a list of 600 magazines, that will take about 50 hours. Even if you have an assistant working for only $10 per hour, that's more than the cost of subscribing to a full-year Editorial Edition from ADBASE that also includes book publishers. Now that's for only one update. If you plan to send out additional mailings throughout the year, you will have to update the list again costing your more time and money. But, this isn't about Mastheads (read the previous piece for more information on them), it's about proving the value in preparing and maintaining the list. If you consider a list is $700 a year, that's about $60 a month so that you always have a ready and up-to-date list of e-mails, and then there's a nominal charge per 1,000 e-mails as well. And, these are qualified e-mails too. So, it seemed to me, after the extensive amount of time I spent preparing just 1,100 e-mails, that using a pay service with tens of thousands, where they've done all the hard work of validating e-mails, and organizing them, might just be a far far more effective and efficient (and time-saving) way to go. To that end, as I noted above, we're working on an extensive review of adBase, and hopefully AgencyAccess too.